The first, and possibly only, folk rock super group, Crosby, Stills, Nash and Young are noted primarily for their intricate vocal harmonies, stunning compositions and often tumultuous interpersonal relationships. Political activism and an ongoing influence on American music and culture probably come reasonably close. All four members have been inducted into the Rock and Roll Hall of Fame twice, although Young's inductions were for work not involving the group. The CSNY story is one of the most fascinating albeit frustrating of any major rock/pop act across the period the band have existed, woven as it is with multiple changes in line-up, compound fractures, the aforementioned interpersonal problems and a host of other factors. However, their body of work stands as testimony to a group whose main purpose has been ever successful. 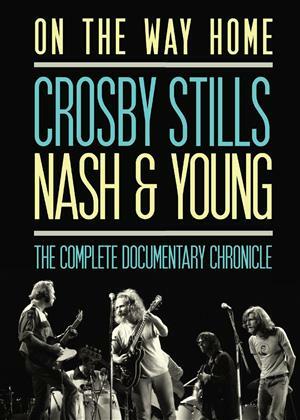 This double video box set documents the almost half century that Crosby Stills Nash and Young have worked together, despite this period being an intermittent one with only a limited number of occasions that all the members shared a stage, a recording studio or a hotel lounge, and while they are all accomplished writers, not a song exists on which all four share a credit. The first video looks at these occasions and at what caused them to take place, while the second disc -taking a different angle - looks at the early career of their most occasional member, Neil Young, and explores how his role in CSNY came about and how it paralleled a hugely successful solo career. With both films crammed full of; rare footage, new and archive interviews, seldom seen photographs (many from private collections), location shoots, news reports and contributions from those who have known the group best, this set stands as the finest document yet on the lives, career and work of this remarkable quartet.